Located on Internet Pl off Solutions Ln and 44th Ave E, Extra Space Storage serves Bradenton residents near Lakewood Ranch, Esplanade, Braden River, Fort Hamer, and more. Locals will recognize our facility near Lakewood Ranch Gymnastics. Extra Space Storage on Internet Pl offers a wide selection of storage units, climate-controlled storage, drive-up access, and exceptional security. 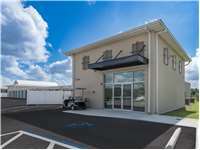 We're your go-to storage partner in Bradenton near Lakewood Ranch! No matter what you need to store, our Lakewood Ranch storage facility has the space for you! Units are available in sizes 25 square feet to 300+ square feet with features like drive-up access, indoor access, and more. With advanced security features like 24-hour video surveillance and electronic gate access, you can store valuable belongings with confidence at Extra Space Storage in Bradenton. When storing delicate items in Bradenton, a climate-controlled unit is highly recommended. Climate control maintains temperatures between 55 and 80 degrees year-round, keeping your belongings safe from Florida's extreme heat and humidity. Save time at our Internet Pl storage facility with drive-up self storage. This convenient feature allows you to pull a vehicle up to your unit to move item in and out quickly. Units with drive-up access come in sizes 10x20 to 15x45, and larger drive-up units can even be used for car storage or boat storage! At Extra Space Storage, we believe our customers deserve the best. That's why we offer reliable, high-quality self storage in a clean, secure, well-maintained facility. We also have a friendly, professional staff that's dedicated to ensuring you have an incredible storage experience. Let us know if you have any questions or need assistance. Contact us today to reserve a storage unit in Bradenton! I highly recommend this Extra Space Storage. The facility is extremely clean and they are willing to help you find the space that is just right for you. Nick was awesome and very helpful. I would recommend extra space storage to anyone who asks. Hey Lakewood Ranch this is to place your store all your extra stuff, A great location with easy access. Great price without having to move to a house with more storage space. When you go tell them Troy sent you. The facility is brand new and very clean, and Nick has been very helpful. Drive south on Upper Manatee River Rd. Pass Lakewood Ranch Plaza and continue south on Lakewood Ranch Blvd. Turn right onto 44th Ave E. Turn right onto Solutions Ln. Turn right onto Internet Pl. Our facility will be the end of the street. Drive north on I-75 N. Take Exit 217A and merge onto E State Rd 70, passing Walmart. Turn left onto Lakewood Ranch Blvd. Turn left onto 44th Ave E. Turn right onto Solutions Ln. Turn right onto Internet Pl. Our facility will be at the end of the street. Drive west on E State Rd 70. Turn right onto Lakewood Ranch Blvd. Pass Publix and continue north on Lakewood Ranch Blvd. Turn left onto 44th Ave E. Turn right onto Solutions Ln. Turn right onto Internet Pl. Our facility will be at the end of the street. Drive east on FL-64 E. Pass CVS and turn right onto Lakewood Ranch Blvd. Turn right onto Technology Terrace. Turn left onto Solutions Ln. Turn left onto Internet Pl. Our facility will be at the end of the street.